The loads on building, may be a residential or any type of structure, are mainly classified into vertical and horizontal loads. The vertical loads are the dead and live load. The horizontal loads are the earthquake and the wind loads. This is the general classification of loads. In this article, some of many other important loads are also explained. 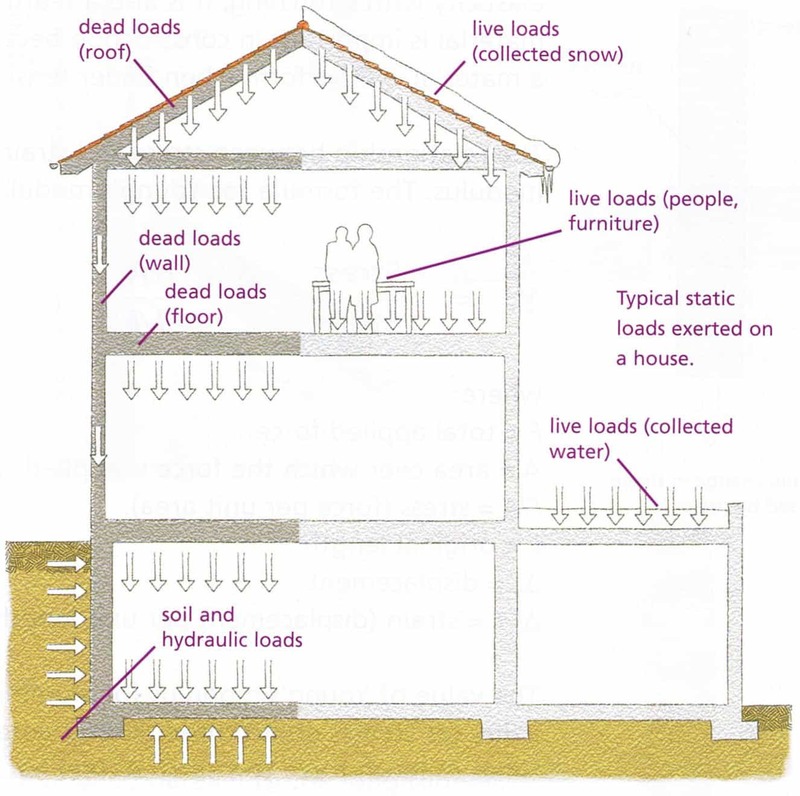 Dead loads (also known as permanent or static loads) are those which are associated with the weight of the structure itself. These loads remain stationary and relatively constant over time. Dead loads comprises the self-weight of any structural elements, as well as the permanent nonstructural partitions and immovable fixtures such as built-in cupboard, plasterboard etc. The calculation of dead loads on each structure is calculated by volume of each section and multiplied with the unit weight. Unit weights of the most used/common materials are given below in the table. Live loads are the temporary loads which are either movable or moving loads without any acceleration or impact. These are also called as imposed loads and are changeable and dynamic. These include loads such as vehicle traffic, the occupants of the building including weights of movable partitions or furniture etc. The intensity of these loads may vary depending on the time of the day. 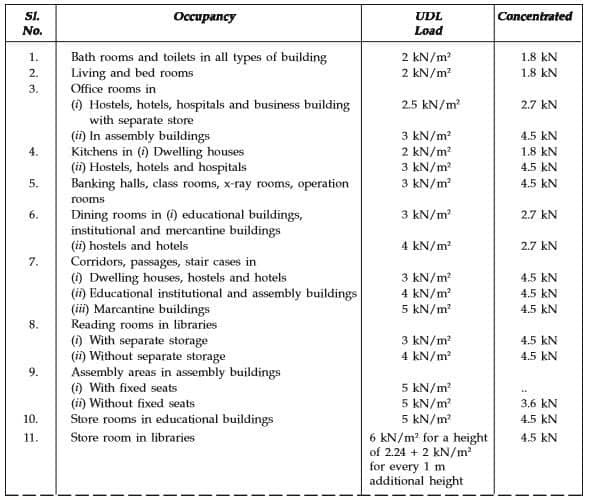 Example (1): an office building may experience increased live loads during the week-day or work hours but much smaller loads during night or at weekends. Example (2):In gym building, usually there are increased live loads at morning and evening time, but smaller loads in the afternoon time as people will be at work. These loads keep on changing from time to time. 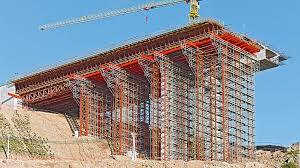 These loads are assumed accordingly by the one who designs the building. It’s considered to be one of the major loads in the design. Some of many important values which are usually used are given below. These values are the minimum values and can be increased wherever necessary. The code provides uniformly distributed load as well as the concentrated loads. The floor slabs have to be designed to carry either of those loads depending on whichever produces the greater stresses in the part under consideration. Since it’s unlikely that any one particular time all the floors won’t be simultaneously carrying the maximum loading, the code permits some reduction in imposed loads in designing columns, load bearing walls, piers supports and foundation. Snow loads are the one which are imposed on the structure due to the accumulation of snow and is more of a concern in geographic regions where snowfalls can be heavy and frequent. Accumulation of adequate quantities of snow can add a sizable load to the structure. As the snow accumulates on the roof first, the shape of the roof is an utmost important factor to be considered in the magnitude of the snow load. 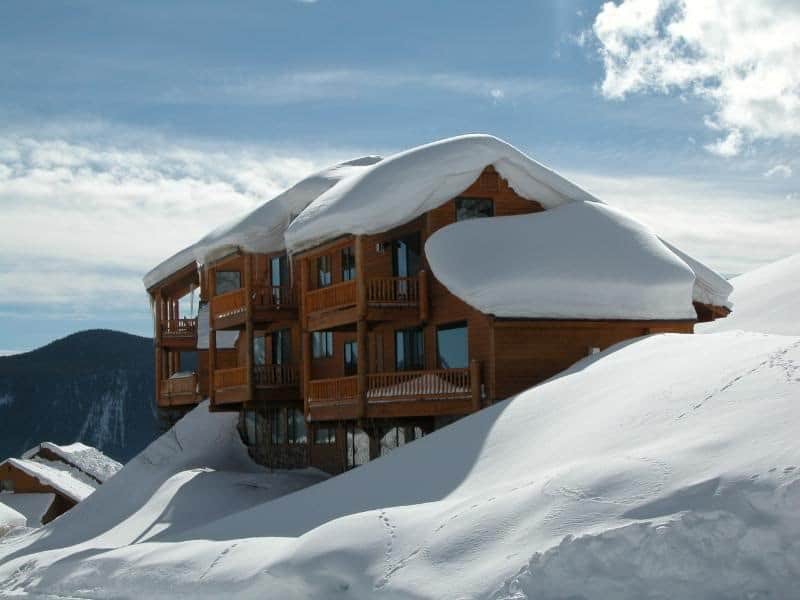 If the roof is of flat type, the snow is likely to accumulate more, whereas the snow will fall of a steeper roof pitch. This issue is similar in areas of heavy rainfall where ponding may occur. Wind loads are the primarily horizontal loads which are caused by the movement of air relative to earth. This load is considered for the building whose height is twice its width, to exposed wind surface. Wind load may not be significant concern for small ,massive low level building, but it attains importance with the height, the use of lighter materials, and also the shapes which may affect the flow of air .When the dead load of a structure is not capable to resist the wind load, then some additional structure and fixings may be needed. In some very complex structures, it might be necessary to undertake the wind tunnel test of the building to access the change in air flows caused by the building. For low rise building up to 4-5 stories, the wind load is not critical as the moment of resistance provided by the continuity of the floor system to column connection and walls provided between columns are enough to resist the effect of these forces. The horizontal forces exerted by the components of the wind also affect the building and is to be kept in mind while designing the building. The basic wind pressure, Vb is obtained from the code and it depends on the locality of the building. The wind pressure is considered to act uniformly up to a height of 30m, above which it increases. 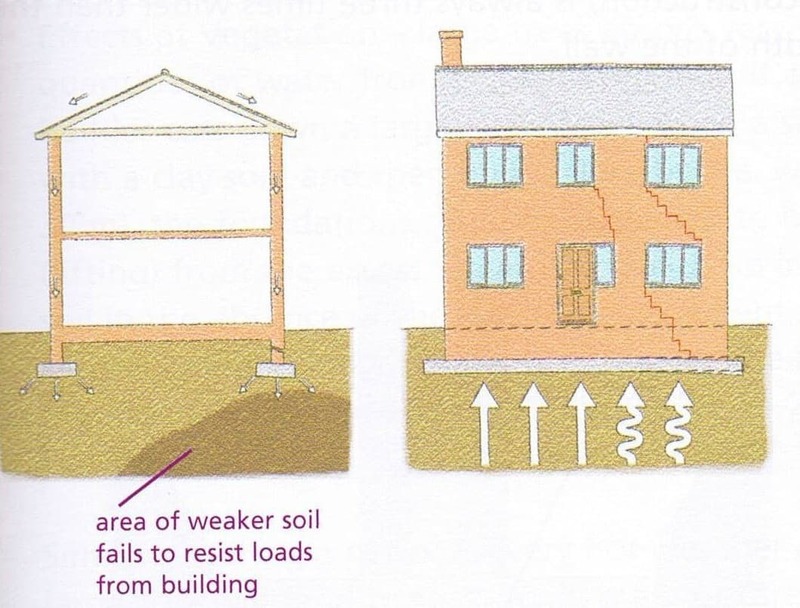 This load is caused by an uneven settlement of foundation of the building which produces an equivalent effect as the high loads. The poor soil condition might decrease the support of the foundation. No additional load is applied to the building but due to the uneven settlement, the supported portion of the building carries more load. These are the loads which are imposed on a temporary or partially completed structure during and as a result of the construction process. These loads include material, personnel, equipment imposed on the temporary or permanent structure during the construction process but are not limited only to these. These loads are also called as thermal loads. When temperature changes for a material, it either expands or contracts. 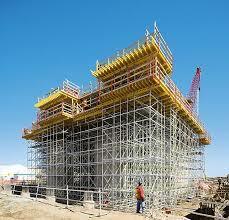 This effect can exert significant loads on the structure. Expansion joints have to be provided at points on long sections of structures such as walls and floors. This facilitates the elements of the structure to be physically separated and can expand without causing structural damage. Also the expansion joints are provided on roads to ensure the safe and smooth running of the vehicles. 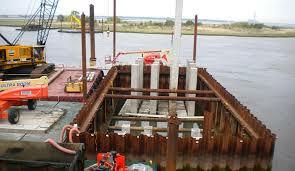 This load depends on the material used for the structure.